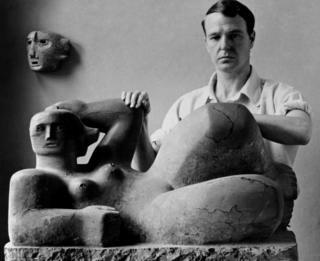 A new exhibition of the works of sculptor Henry Moore has been put together following a £7m revamp of his former home. Becoming Henry Moore will mark the opening of the redeveloped Studio & Gardens in Hertfordshire, as well as the 40th anniversary of his foundation, created to support artists. The exhibition focuses on works from his formative years, from 1914 to 1930. It also includes exhibits from artists who influenced the sculptor. Among the works on show is Moore's first commission from his student days, a World War One roll of honour for his secondary school, which has never before been seen outside his hometown of Castleford, in West Yorkshire. This work, and others including his Reclining Figure, will be exhibited at the Henry Moore Studios & Gardens in Perry Green, near Bishop's Stortford, which has been transformed to include a visitor centre, café and classrooms. Moore's works will be shown alongside those of artists who inspired him, such as Picasso, Rodin, Michelangelo and British contemporaries including Barbara Hepworth and Jacob Epstein. In the 40 years since Moore and his family set up the Henry Moore Foundation to encourage appreciation of the art world and support artists and projects throughout the world, it has awarded grants worth more than £31m to over 2,000 projects and individuals. Becoming Henry Moore runs until 22 October.